Home Critics court Minimum Income Guarantee – Political masterstroke or Historic blunder? As a citizen of India I am appalled to note that a political party can even think that an offer like minimum income guarantee can be attractive to voters. It shows how the Congress thinks of Indian voters. And if it does attract the voters then I can only conclude that Indian voters are running out of good intelligence. In a historic move, the Congress president Rahul Gandhi has promised what he called a minimum income guarantee for every poor person in India, if the Congress comes to power after 2019 general elections. Obviously there are mixed reactions to this. 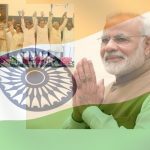 Instead of going into whether the Congress, or any central government for that matter, can fulfill such a lofty promise or not, I would rather talk about the dangers of executing such an ill-thought policy in any country, not to speak of India, a country of some 1.35 billion people. 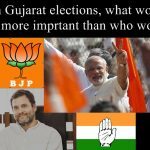 If Rahul Gandhi wants the voters to believe that his party can do something wonderful for the poor then he and the voters need to carefully analyze what a minimum income guarantee could mean to India and Indian citizens. According to the World Bank’s revised methodology of measuring poverty, India had third highest number of people living in extreme poverty in after Nigeria and Congo in January 2019. This of course, was a meager 3.6% in terms of total population. However, according to the statistics reported on Wikipedia, India is projected to be the world’s most populous country by 2024, surpassing the population of China. India’s population growth rate is 1.13%, ranking 112th in the world in 2017 and it is expected to become the first political entity in history to be home to more than 1.5 billion people by 2030, and to 1.7 billion by 2050. Not to speak of 2030 and 2050, even today India’s population is above 1.35 billion with more than 50% of its population below the age of 25 and more than 65% below the age of 35. Meaning a sizable number of people are of earning age. If the poverty calculation by the World Bank is credible, we are talking of around 4.86 crore, or 48.6 million people in India living in extreme poverty. Be it extremely poor, medium poor and less poor, all of them are considered poor. Mr Rahul Gandhi says that if elected, the Congress government will give all the poor of India a minimum income every month. Now let’s look at the amount that will have to be paid out every month under the proposed scheme. Introduced in October 2015, the World Bank’s updated definition of international poverty line starts at US$ 1.90 a day. As of today, this is equivalent to Rs 135 per day. In other words, if a person earns 135 per day, or Rs 4050 per month, he or she is considered “poor” by the World Bank. To keep no such poor in India, the Congress government under its minimum income guarantee will have to pay Rs 4050 each to some 4.86 crore poor in India. So the nation will have to pay total Rs 202500000000, or Rs 202.5 billion rupees per month if India has to have no person under international poverty line. Doesn’t this sounds crazy? But Rahul Gandhi says he has decided to do it. Incredible! Coming to reality, there are massive challenges that the government will need to face ahead of executing the so-called minimum income guarantee. One is the eligibility factor. Who are poor enough to receive it? This question itself can cause enough of stinky politics and social unrest. The other question is, will there also be reservation quota? Will it consider the age factor? What amount will be considered minimum income? Will the payable amount depend on the number of family members, age, health and other factors? And the million dollar question– will the money at all go to the poor, or will most of it go into the pockets of politicians and sanctioning officers? 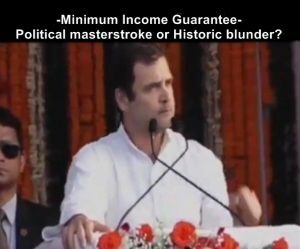 Rahul Gandhi also proclaimed that with the minimum income guarantee the Congress government would do something that no other government in the world has ever done. Right, no other government has done it because no sensible government would do such an insensible thing. If by some chance the Congress wins the 2019 elections, with the minimum income guarantee, India stares at a colossal scandal. By now we know how, after the Narendra Modi government enforced Aadhar card linking, how many fake subsidies and payments came to light. Reports say that people who did not even take birth were “paid” money, subsidies and other facilities every year during the UPA rule. The amount paid in the name of non-existing people was a whooping Rs 57,000 crores per year! Obviously this money was going in some politicians’ and officers’ pockets. Imagine what could happen if the same government is to distribute Rs 240,000 crores every year to maintain its minimum income guarantee, and that too to the poor who do not understand how things go wrong. The stolen amount of money could be mind-boggling. The same challenges and dangers lie with a non-Congress government also but from last four and a half years’ record we can hope that the amount of corruption under the NDA government would be much less. No confirmed scandal has come to light during the present NDA government does not necessarily mean there has been no corruption. At the same time it also does not mean there has been corruption. The NDA led by BJP also has seen corruption in the party and has, at times, supported corrupt leaders, but under Prime Minister Narendra Modi’s leadership the party has come a long way and made a noticeable progress earning it a tag of a non-corrupt government around the world. 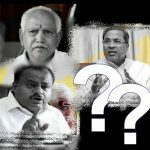 On the other hand, the Congress tradition of creating scandals after scandals during last few decades has left no hope among alert citizens of India for any change although personally I believe that even the most degraded person, or party for that matter, can change by the grace of God if the wrongdoer repents for his or her misdeeds and sincerely works on self improvement. Unfortunately, as of today, I do not see any symptom that makes me think that the Congress party is sincerely trying to rectify its faults in the interest of India. This is primarily because of their ideology, which is rooted in and supported by anti-India nations some of which have their presence in India through political parties, media houses and societies. What we need to realize is, the root cause of these nations’ hatred towards India is not only money or power; it is also religion. The animosity dates back much before the 1st and 2nd world war. Unknown to the most, it links to the Mahabharat war and beyond in the history. As a side point, from historical evidences it appears that after losing the Mahabharat war, some of the descendants and relatives of the kings who supported king Durayodhan could not give up their enmity towards Pandavas and Hastinapur, the then fabulous capital of Bharat. They either fled or settled in far away countries but maintained hopes to cause damage to Hastinapur and Bharat. The same Hastinapur is presently known as New Delhi and the same Bharat has now become known as India. This is why we see neighbouring countries like China, Britain and even Russia find every opportunity to take on India and harm or belittle its ancient Vedic culture. 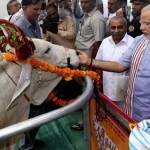 There are other historical reasons why today’s India and Vedic culture are facing stiff resistance from certain classes of people and nations. Coming back to minimum income guarantee, the Congress and its supporters need to realize that such a scheme will only throw India back into chaos, even if the country can sustain it from economics point of view. In fact it could make the situation worse than it has ever been. Do they realize the consequences of such a thoughtless scheme? It can make people lazy, the infamous devil’s workshop. It can increase crimes, it can diminish the value of education, it can promote dishonesty and corruption on every front and at every level, it can make and keep the citizens increasingly dependent on such income and increase government’s burden, it can promote waste of money as people who don’t work hard to earn hardly understand the value of it, it can wipe out the reserves and resources of a country like India in no time due to minimum work, minimum production and minimum export. The GDP can take a nosedive never seen before and India’s economy can collapse to an irreparable state. Is this what the Congress wants? As a citizen of India I am appalled to note that a political party can even think that an offer like minimum income guarantee can be attractive to voters. It shows how the Congress thinks of Indian voters. And if it does attract the voters then I can only conclude that Indian voters are running out of good intelligence. Every intelligent person should outrightly reject such lollypop offers. Farmer loan waivers fetched victory for the Congress in the last state elections. Now it aims at winning national elections with this bluff. Farmers loan waivers still has some merits but expecting a minimum income without working is a sign of dishonesty. What can be said of the leaders then who encourage it? Besides, such policies can eventually make people slaves of the government. 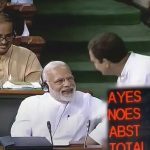 While the Congress must have expected the voters to welcome its historic announcement, it may not go well with many Congress supporters who understand the negative outcome mentioned above. Such an irresponsible announcement can affect voters sentiment and drive them away from the Congress. Especially those who can see the complexities and dangers involved in implementing this offer, and those who are not yet sure of who to vote, are likely to reject the Congress due to this bizarre announcement. If the Congress wins and pays the poor a minimum income, it could potentially ruin India and the Indians as mentioned above. If it fails to fulfill the promise, the poor will never forgive them. If it fulfills the promise it would most probably destroy India’s economy to an irreparable state. And if it disappoints its supporters by this outlandish and unrealistic promise, it could lose the election. With such a lose-lose scenario, it is likely that the move now hailed as political masterstroke by the Congress and its alliance would eventually be remembered as a historic blunder.